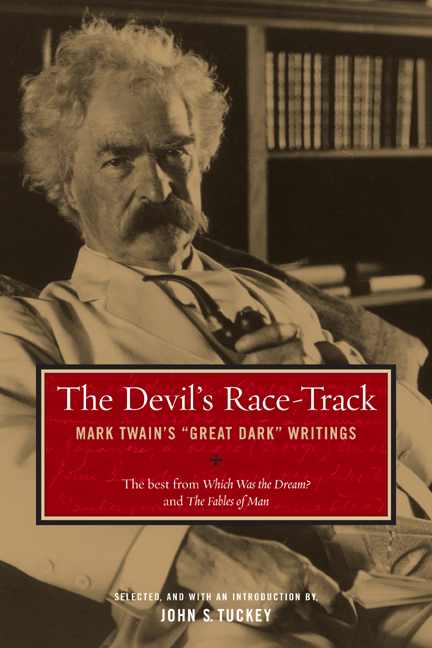 Mark Twain explores the darker side of life in these lesser-known later writings dealing with personal tragedies, nightmarish world events, and a doubtful cosmic order. He views his own situation as that of a ship trapped in a fearsome Bermuda Triangle-like region, the Devil's Race-Track. He sees history as a treadmill of endlessly and monotonously repeated events. And he conceives of a universal food chain, a vast round of devourers who in their turn become victims, humankind and God included. The tone of these writings is lightened considerably by Mark Twain's sagely ironic humor and his warmth, which together balance his tough-mindedness. And even when he shows the human race caught in some vicious circle, he may be seen courageously seeking a way out and at times believing he has found it. John S.Tuckey was Professor of English at Purdue University. He was the author of Mark Twain and Little Satan as well as other studies on the writings of Mark Twain.